Water is an important resource which we use in almost every part of daily life. The raw material may appear to be plentiful but, worldwide, and even in parts of Ireland, it is an increasingly scarce resource. It is not only humans who rely on water, it is also important for the survival of all other living creatures and habitats. Thus, a sufficient supply of clean water is essential to the health of people and the environment. This theme looks at developing awareness around water conservation and how to effectively manage this important resource in our schools and at home. 99% of the world’s water cannot be used because it is either saline (i.e. salt water) or is locked up in glaciers and ice sheets. Rapid expansion in urban populations has resulted in increased pressure on Local Authority wastewater treatment facilities and, in many instances, the inability to cope with the increasing volumes of waste generated. A hosepipe or sprinkler can use 1,000 litres (or 1 tonne) of water per hour. This is as much as a family of four would normally use in two days! Our own bodies are two thirds water and our brains are at least 85% water! A powershower uses almost 125 litres of water in five minutes. That’s a massive 250 litres in 10 minutes! The World Bank estimates that by 2025 1.4 billion people in 48 countries may experience water stress or scarcity. Twenty multi-school student forums have been held around the country each year since Irish Water began to sponsor the Green-Schools programme in 2013. The forums employ a mixture of interactive demos, water related games, PowerPoint presentations, water themed clips, videos and, importantly, group work to deliver a water conservation message to schools and by extension the whole school community. The forums enabled schools to engage with each other and share their knowledge and experience of the Green-Schools Water theme. They provided an opportunity for schools to discuss any issues they encountered during their programme and to seek advice from other schools, Irish Water, Local Authorities and Green-Schools staff. During the forums students also learned about the Seven Steps of the Green-Schools programme, how to successfully complete the water theme and important issues surrounding water. 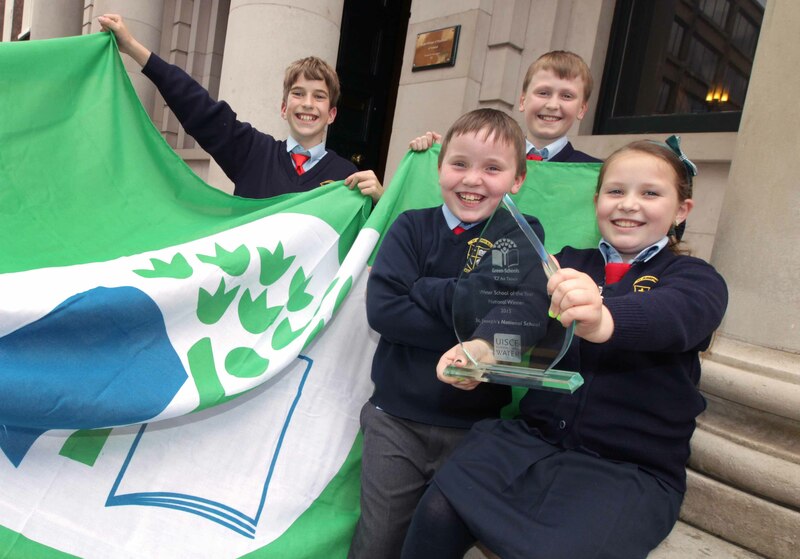 Green-Schools Water of the Year Award, supported by Irish Water, recognises innovation and creativity among schools that apply for the An Taisce Green Flag for Water. It also acknowledges achievements in water reduction, spreading awareness about water issues and involving local communities in the schools Green-Schools water programme. This award has been running since 2013/2014 academic year and recognises four primary and four secondary school regional winners and from these winners one primary and one secondary school national winner is chosen. To celebrate World Water Day (22 March) and spread awareness of water issues around the world you can join other Green-Schools and organise a Walking for Water event or participate in one of the walks organised by Green-Schools. Each year Green-Schools, in partnership with Irish Water, hold walks in locations around the country and encourage schools to do the same. View photos from previous year’s Green-Schools walks in Glendalough, Gougane Barra and Glenveagh National Park here. In early 2016 Green-Schools, in partnership with Irish Water, ran its first ever ambassador programme. Since then the programme has grown and in November 2017 we ran workshops in Cork, Roscommon and Dublin for our latest group of ambassadors. The aim of the programme is to engage directly with second-level students on the topics of water, water conservation, treatment and the marine environment and encourage them to act as ambassadors for Green-Schools in their own schools and local communities. Successful candidates take part in a one day workshop: the morning session of each training day involves speakers from Green-Schools, Irish Water and Clean Coasts. The topics discussed during the ambassador training days include: Green-Schools (what it is), the scarcity and importance of water, walk for water, water pollution and water quality testing, water saving techniques, virtual water, communication methods, engineering, marine litter, wastewater and water treatment. The afternoon session of each training day included a visit to a water/wastewater treatment plant where students saw firsthand what processes water undergoes. Students are also invited to a second day each Spring where they can catch up on their work as ambassadors and get more in-depth training from Green-Schools. Following the submission of reports, Green-Schools Regional Ambassadors are chosen from each year’s group and awarded at a ceremony in May each year. The Green-Schools Irish Water poster competition has been running since 2013/14. It invites students from Green-Schools currently working on the water theme to submit an A3 poster under a particular water related theme. The last themes include: Value Water; From the Cloud to Your Glass; and Be Water Smart. There are three categories for entry and regional winners are selected from each category (a total of 12 regional winners). National winners are selected from the regional winners in each category (totalling three national winners).